The pressure is on for the building services industry to support businesses and organisations in identifying cost-effective solutions that will lessen their building’s environmental impact and operational costs. Reducing energy consumption makes perfect business sense, lowering energy costs while improving the comfort levels in buildings, for increased occupant wellbeing and productivity. Heat is the largest single-end user of energy in a building, making it a natural target for improvement measures. As the government highlighted in its Clean Growth Strategy, reducing waste from heating is also essential if the UK is to achieve its steep carbon reduction target of 80% by 2050. It recommends nurturing “low carbon technologies…that are as cheap as possible” – low carbon technologies like combined heat and power (CHP). A core component of heat network schemes, CHP also offers compelling financial, environmental and strategic advantages as a standalone heating system in buildings with a high, constant heat demand. As such, a well-maintained CHP system is set to play an increasingly important role in the years of change ahead. CHP generates heat and power in a single process at the point of use. Unlike traditional power stations which reject ‘waste’ heat to atmosphere, with CHP the heat is recovered onsite and used for space heating, domestic hot water or heating swimming pools. In this way, a low carbon CHP system is around 30% more efficient than using traditional heating plant and electricity supplied solely from the grid. And by generating electricity on site, CHP can produce electricity at lower gas prices. All of which adds up to significant financial savings and improved energy security for businesses, particularly during the triad periods when grid power demand surges. Of course, CHP will not be the right solution in every building. But in buildings with a high and constant requirement for high grade heat and power, CHP is a cost-effective tool to long-term economic and carbon savings and increased energy security. Residential care homes, student accommodation blocks, leisure centres with heated swimming pools, and schools and universities with extended hours are all examples of sites that will benefit from CHP. It’s impossible to mention CHP without stressing the importance of accurate sizing to ensure maximum performance and benefits. Get the sizing right and a continuously-running CHP unit will generate low cost, low carbon electricity as a by-product of producing base load heating. The hydraulic design is equally important as CHP operates more effectively and efficiently at lower system return temperatures. Connecting the CHP return to the lowest available temperature will guarantee the longest possible running hours from the CHP system and the greatest economic benefits. These design factors need to be considered at the outset. And given that 80% of the lifetime costs of a building occur in the operational phase, it follows that future maintenance should also be addressed at the early stages. All heating equipment benefits from routine maintenance to keep it operating efficiently and reliably – and CHP is no exception. 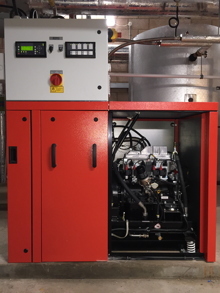 Good suppliers will offer a choice of CHP service levels, all of which include inspections at regular intervals, typically at around 6,000 CHP operating hours for a 20kWe unit. What does the service include? Just like a car service, scheduled CHP services will include checking, and replacing where necessary, service parts. Engine oil will be analysed as will water quality. This will help prevent the inconvenience and costs associated with breakdown. When investing in CHP, it’s worth considering units that have system separation which is normally achieved by an integrated plate heat exchanger. This will protect it from any debris or contamination in older heating systems and increase its service life. Almost all buildings emit air pollution due to combustion in their heating, cooling or electricity generation systems. 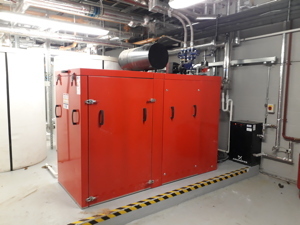 More stringent NOx emissions requirements have been introduced for CHP, amongst other heating equipment, in response to the drive for improved air quality. The environmental assessment scheme BREEAM, for example, has introduced a new NOx benchmark of 50 mg/kWh (0% O2) or less for new build developments. Still-tighter NOx emission levels of 40 mg/kWh (0% O2) or lower are required from heating in high pollution areas in the Capital under the London Plan. Ultra-low NOx CHP systems like the R-Gen series are fullycompliant with all environmental and NOx legislation. But to ensure that the appropriate NOx levels are met throughout the lifecycle of the CHP unit, opt for service plans that include emission monitoring as an integral component of the programme. Using experienced, dedicated CHP engineers to service the unit means that maintenance is carried out with minimum disruption. And as an estimated 85% of reported CHP faults are able to be corrected and reset remotely, this reduces downtime, inconvenience and costs still further – as well as the carbon emissions associated with a site visit. CHP offers energy and carbon saving potential in buildings with high and constant heat demand. What’s more, by generating lower cost, low carbon electricity on site, CHP also provides businesses with the opportunity to ensure greater energy resilience and energy security. But when refurbishing the heating system with CHP, the installation stage is just the starting point. To ensure long-term CHP operational efficiency, it’s essential to address maintenance and servicing from the outset. With effective communication between specifiers, designers, contractors, suppliers and end-users, the full economic, environmental and strategic benefits of CHP can be achieved.